There, I said it. 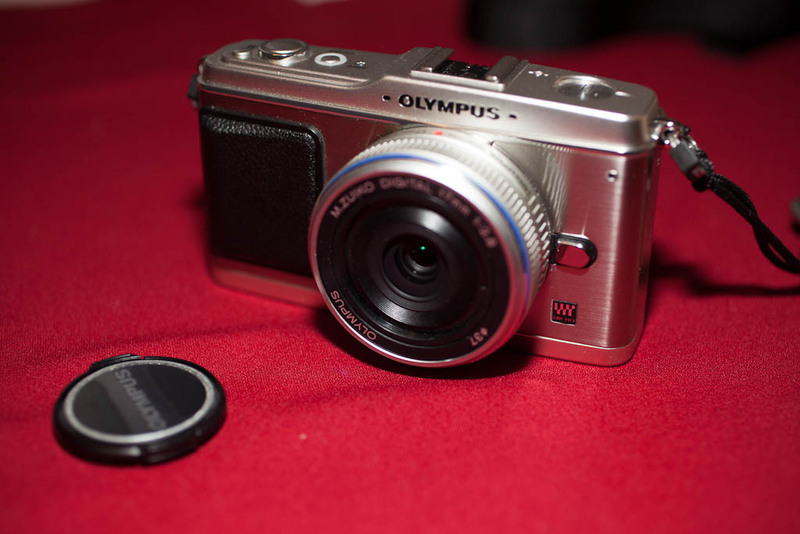 The future of interchangeable lens cameras is mirrorless. The SLR design date back from the film days. A design that allow precise framing using through the lens viewfinder, but that has a somewhat complex mechanical design, increasing cost and size. Today, the film being replaced by an electronic sensor, an instant image can be obtained through the lens. An electronic viewfinder will also be through the lens, with all the advantage of the SLR design, and more. Without the need for that complex and bulky mirror box, the camera can be designed to be more compact. There are a few reasons why DLSR exists and are still somewhat the de-facto design: trade offs. The first trade off is that you have to change the lens mount to benefit from a more compact design. This made moving from the older film camera to the digital one is not as easy unless you threw away your investments in glass. This was a perfectly valid point in the last decade, and since the move has happened, the problem persists, even for those that started with a DSLR. The second trade off is the performance of the autofocus system. DSLR use a phase detection system with sensor located in the mirror box. Something that appear to be problematic on a mirrorless camera, and phase detection AF is more performant than the contrast detection system commonly used by mirrorless cameras. Manufacturers have worked out technology to improve the situation a lot. A small category of users that needs it really needs it still, but we are getting there. But it is time to make the jump. Currently only 4 vendors still offer DSLR. Canon, Nikon, Ricoh-Pentax and Leica. Sony hasn’t released a DSLR in a while and given their α lineup (mirrorless), I don’t think they will, Olympus has made the switch to M4/3 a while ago already, Panasonic has been mirrorless only as well also with the M4/3 system, Leica is mostly betting on mirrorless and Fujifilm has been kicking it with the X- series, improving at each generation and the GFX medium format. In August Canon announced the EOS R, their full frame mirrorless system, while they have a EOS M series that feature an APS-C sensor. They just announced new lenses for that system, so it might stay for a little while. And it is much more affordable as well. Weeks prior to that, Nikon had just announced the Nikon Z, their full frame mirrorless system, after discontinuing the Nikon 1 which wasn’t really a sensible proposal with its miniature sensor. As for Ricoh-Pentax life is tough. The Pentax K 01 wasn’t really a success, nor was the Pentax Q that disappeared as quickly as it appeared. And now that it is Photokina, it doesn’t seem that Ricoh had anything to announce in that product line. If anything, the growth on the market for Sony as proven that mirrorless full frame can be a viable option. Sony is clearly the market leader for full frame and Canon, Nikon and Panasonic wants to try to catch up. Is full frame the future? I don’t think it will be the only but it will be dominant. Panasonic just announced a full frame mirrorless, sharing the lens mount with the Leica SL, while still continuing with the M4/3, and Sigma who barely has presence in the camera body market has announced they were developing a body for the L-mount. I’m confident that Fujifilm can continue with the X-series without moving away from APS-C, with a more compact system that nails the image quality including in low light, at a price lower than the current full frame lineup. Sony will probably keep some of their APS-C mirrorless until they can bring down the price of the α series down enough. The medium format has a future too for demanding users, but the price is steep. For example, the Fujifilm GFX 50, a “medium” format sensor mirrorless starts at about US$5,000. I predict that within 5 years, neither Canon nor Nikon will be pushing DSLR, except maybe in a few niche segments like top of the line sports. The Leica S might survive as Leica just announced the S3 just 10 years after the previous iteration but this camera is already in a very niche segment given it’s price. And some of the manufacturers won’t be left unscathed. Today, Leica announced their new mirrorless camera for the Leica APS-C System, the Leica CL. Not to be confused with the 1970’s era film rangefinder Leica CL that was developed with Minolta. This new camera body comes as alternative of the TL2, with the same 24 megapixel sensor and Leica “Maestro II” imaging system. Unlike the TL2, the Leica CL has an EVF built-in, without being bigger. Body only, the camera is at roughly USD$2800, it uses the same lenses as the TL2. Also introduced today, an 18mm f/2 “pancake” lens (27mm equivalent) that will set you back by USD$1300 ; albeit as a kit lens, the whole camera (body and lens) will be around USD$3800. This camera plays more in the same field as Fujifilm X-series, albeit at the Leica price tag. Also unlike Canon, this camera do 4K video, even though it wouldn’t be my choice for this purpose. In the mirrorless game, Leica seems to have found their product segemnt: high end quality camera, with a solid lens lineup. Once upon a time, there was the Leica M8. Then there was the M9. Then Leica called them M, with some obscure “Typ” number next to it. Now the new M-series is the Leica M10. At least that’s logic. The Leica M10 is the latest installment of the Leica legendary rangefinder camera, digital, using M-mount lenses. Still pricey, still high-end, still with its own style. Yes they removed the video mode that was on the M Typ 240. Another new things: Leica added a control wheel for ISO were the film rewind would (there was nothing on the previous digital M). Also, the preliminary tests show a sharp increase of the image quality. Leica announced yesterday the Leica Q (Typ 116). It is their take on the Sony RX1 product segment: full-frame sensor fixed and fast wide angle lens camera, not in the lower price range either. Unlike the Sony, the Leica has a built-in viewfinder ; the 28mm lens is half a stop slower (f1.7 instead of f1.4) and it has a higher price tag. By ~$1k if you factor in the cost of the EVF for the RX1. Size-wise it is bigger than the RX1 (no EVF) and smaller than the Leica M.
The camera include a fast autofocus system, that can be controlled from the rear touch screen, and proper manual focusing capabilities, as the lens has a know like on the M lenses and the EVF has focus peeking ; this will make rangefinder users happy. And the others will probably like that too. The camera is “Made in Germany”. Note: This is just news and not a review as I haven’t had it in hand. Leica just announced the Leica T. Their new mirror-less system ; and by that I mean non rangefinder but really digital mirror-less with interchangeable lenses, APS-C sensor, with their own mount, and two new lenses including a 23mm f/2 (feel like a 35). Sadly it seems that the trend persists, there is no built-in viewfinder. Also it has a Leica pricetag, even if no as high as Leica M.
On overall the Leica T seems to get somewhat positive reviews, and the design is slick, to not say outstanding on some aspects, and minimalist where all the complexity is in a touch screen. All in all it looks like Leica focused on the basics: photography, and let the gimmicks on the side. But, oh boy, why is it a $600 extra for an external electronic viewfinder? The camera itself has nothing like the range of features and capabilities that its prime competitors have to offer, but then it isn’t intended to. Thus any such comparison would be pointless. This is a very cool camera. The look is like nothing else on the market. Now I wish I had a loaner to try to have a better sense of what it feels. The Sony Alpha 7 and A7R have just been announced and feature a full frame interchangeable lens mirror-less camera for around $2000. This niche was held so far by the Leica M at a much higher price point. Unlike the Leica, this is not a range finder. Brian Smith has a field test that show what we can expect: an IQ Sony style (pun intended), ie good. I believe that for a modern design system, “full frame” is possibly overkill, and Fuji has shown us that you can get top notch IQ with an APS-C sized sensor. Most DSLR systems, like Canon EOS, Nikon, Sony or even Pentax were designed for 135 film, as well as their lens, hence the “full frame” bias. This is also why I considered the RX-1 overpriced and overspeced, even though some people have found it worth it ; and with a top image quality as well. At $2000 body only the A7 can even be cheaper than the RX-1. But this Sony is an E-mount (like on the Nex), with a short flange distance, that allow an easy adaptation of older lenses via easily available mount adpaters, including M-mount. This is probably why this camera has a lead off the m4/3 or even the Fuji. You get the real deal, the same field of view on your older lenses as they were designed. The only other alternative today is the Leica M type 240, which is both much more expensive (several time the price), hard to come by, and for which adapted lenses require either the use or the rear LCD or the external EVF. I do believe that the A7 and A7R will find their way in the hands of people that have a large collection of lenses to adapt, and we can be largely confident that the image quality will continue to meet the expectations. Sony has really shown leadership on a market that was dominated by Olympus and Panasonic, and show that Nikon and Canon have to worry given their disappointing incursion into mirror-less land. I previously said the Leica X-Vario was a disappointment solely based on the price and the slow zoom lens (and the lack of viewfinder). I think I shouldn’t be commenting on gear like that. We see some positive reviews flourishing, mostly based on image quality and ergonomics, two of the main reason to use one camera over the other. Despite the yawns from some of the more technically minded on the internet this is pretty much a unique camera – being the only currently available APS-c sized camera with an integral zoom lens (the Canon G1x sensor is rather smaller). So it seems to me that at the very least Leica have produced an interesting modern take on a popular design strategy. However, over the months I’ve rather fallen in love with the simplicity of the X Vario – the logic of the controls is hard to fault, the image quality is really excellent and the fact of it being a simple one-stop package is really compelling. Simply put he turns this one as the camera he has with him when he doesn’t have any other. And if someone want to loan one to me, I’ll be sure to be fair with it.